'Tis the season to be shopping for best-selling books. Thanks to an almost comical price war that has broken out among a few of the country's retail giants, more people may be reading over the holidays. On Oct. 15, Walmart, the world's largest retailer, announced it was lowering its online preorder price for 10 new book releases. The new cost: a measly $10. The titles include the Sarah Palin memoir Going Rogue, John Grisham's Ford Country and Michael Crichton's Pirate Latitudes. Not to be outdone, Amazon.com matched Walmart's price on the same books. Walmart then lowered its offer to $9; by the next morning, Amazon was down to $9 too. Believe it or not, that afternoon Walmart lowered the price by a penny, to $8.99. Then last week Target saddled up to the poker table. On Oct. 19 the retailer announced it would also sell preorders on seven of these books for $8.99. (Target.com has since matched Walmart.com and Amazon on all 10.) Walmart responded by dropping its price by another penny, to $8.98. There's no word whether Walmart then stuck out its tongue and yelled "Nah, nah, nah, nah, nah, nah" to its rivals. For consumers, this war looks like an obvious score. Cheap books make tidy stocking stuffers. And for the retailers, particularly Walmart and Target, the discounts may not carry too much risk. Books are just a small slice of their portfolios. "Is Walmart making money selling books at $8.99? Probably not," says David Heupel, a senior equity portfolio manager at Thirvent Financial in Minneapolis. "This is a mass-merchant move to draw customers to the websites." 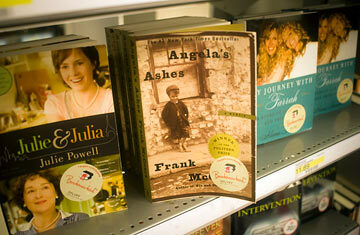 The hope is that you poke around for a book and then add other, higher-margin products to your basket. The war carries a somewhat higher risk for Amazon, since book sales are still a bread-and-butter portion of its business. "This price war is not the greatest development for Amazon," says Heupel. "But will it move the needle for these guys? No. The Kindle is the endgame for the company." Amazon's hot digital reader will also face stiffer competition over the holidays. Barnes & Noble, for example, just unveiled its new entry into the market, the Nook. But Kindle sales are still strong. "Kindle has become the No. 1 best-selling item by both unit sales and dollars  not just in our electronics store but across all product categories on Amazon.com," Amazon founder and chief executive Jeff Bezos recently said. Amazon's profit soared 68%, to $199 million, for the quarter that ended Sept. 30. The book discounts could draw traffic to the site and tempt shoppers to pony up for the $259 Kindle. While consumers and the retailers are bullish about the discounts, it's the book business that's throwing a fit. "The fear is that people get used to paying less for books than it costs to make them, which puts downward price pressure on everything," says Michael Norris, a publishing-industry analyst for research firm Simba Information. Wholesale prices for publishers and advances for authors could all get hit. This pricing could also crush big book retailers like Barnes & Noble and small independent stores. "I wouldn't want to be a mom-and-pop bookseller right now," says Heupel. The industry is so concerned about the battle that the American Booksellers Association has asked the Department of Justice's antitrust division to investigate the retailers' pricing practices. "Amazon.com, Wal-Mart and Target are devaluing the very concept of a book," the organization, which represents locally owned independent bookstores, wrote. "The entire book industry is in danger of becoming collateral damage in this war." Amazon and Walmart declined to comment on their pricing practices. "This is a promotion in order to drive traffic," says Target spokeswoman Kelly Basgen. "This is not a long-term pricing strategy." Those words might be soothing to publishers. But shoppers might want to start stockpiling those books real fast. Follow Sean Gregory on Twitter.